You bring your purse everywhere with you, right? Well, think of all the germs that get on it especially when you are in a public place for a meal. Gross, huh? 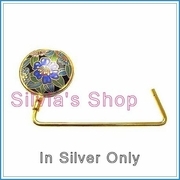 Well, If you get a purse hanger from Silvia's Handbags you can actually keep it in your purse, and then just take it out, clasp it on the side of the table or bar, and hang your purse from it. It works great and it looks great and it keeps your purse clean so it will prolong the life of it!